Sorry but I will only alter bridal gowns. Do you need an appointment for bridal dress alterations? What forms of payment do I take? I will see a limited number of customers. Business starts January 4 and will end in October. So book your appointments early. Those who have November, December, January and February weddings should schedule appointments in September and October at the latest. "So it would be best to schedule your bridal dress alterations as soon as possible. Once I take a certain amount of appointments I will not be taking any additional appointments. I apologize in advance if I can't fit you in when you call." I expect at least 1/2 of the costs as down payment at the first wedding dress alterations fitting. The balance is to be paid when you pick up the gown. The turn around time usually is 2 - 3 weeks. during the months from January - February. From March - October it will be 6 weeks minimum. Some, depending on what is needed, will require a longer time frame. Rush fees will apply for those who have 5 weeks or less. Your delivery date will be set no less than 2 weeks before your wedding day. 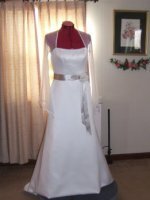 I do not do alterations within the 2 week period just before the wedding day. If you are on a diet, pregnant and or planning on taking wedding portraits you need to let me know this at least 3 months in advance of your wedding date, so I can adjust my delivery schedule according to your circumstances. Otherwise, I suggest getting your bridal dress alterations taken care of as early as possible, to make sure I can fit you in the schedule. For your appointment you need to bring the undergarments that you will be wearing under your gown. This is important in order to achieve a good fit. Must have the bra you will wear with your gown. You would be surprised at how a gown will look and fit differently from one bra to another. Also wearing body shaping garments will make your dress fit totally different when compared to not wearing one. So make sure to bring it with you to all fittings if you plan on wearing one. And if you need a hem, you must bring the shoes that you will wear the day of the wedding. Remember your petticoat slip to go under your dress. It will make a difference in your hem, since they can lift the dress hem off the floor a little. So to re-cap... make sure you have the bra, any shapewear you plan to wear, bridal petticoat slip and shoes. Not having what you need will mean I will have to reschedule you. Read my service policies for more about this. My business philosophy is structured around this fact..." I try to put myself in my customer's place." "I treat my customer the way I would want to be treated if I were a customer!" I also feel my work represents me, so I work hard to make sure your dress is right. I have kept the business in my home all these years because I enjoy giving my clients individualized attention, something I feel is difficult to do in a store front business. "I feel brides have enough stress with planning their weddings and should not have to deal with that at a dress fitting." Happy brides is what I like to see!